When the BolderBOULDER said they were sending me a brand spakin’ new pair of Skechers GOrun4s to try out, I was all “awesome, free shoes”! After all, it cannot be disputed that the two of the best words ever invented are ‘free’ and ‘shoes’, especially when they are in a sentence next to each other. That being said, the word ‘Skechers’ raised a little flag in my head. I was a teensy bit apprehensive to try them out. Mostly because I’m super careful and picky about my shoes, and never buy a pair without doing a gait analysis in them first. I firmly believe that the wrong shoes can seriously hurt you. Just ask Cam. The other reason I was apprehensive was that, well…they’re Skechers. Granted, these kicks were developed by their Performance division with input from Meb Keflezighi and Kara Goucher, but there was still a bit of a stigma in my head. And when I told people I was testing out a pair of Skechers for running, I got a similar reaction to the one I had. “Skechers? Really?” “But do you think they’re really for running, though?” There was only one way to find out! New (free) shoes are the BESTEST! Things I liked: Right out of the box, the first thing I noticed about these shoes is how incredibly lightweight they are. According to the Skechers website, these weigh 5.2 oz per shoe (based on a size 7). They should totally be floating in mid-air. Secondly, my husband LOVED them and if they were bigger, I think he might have stolen them from me. The sole is super cushy, and they felt fantastic when I put them on and wore them around the house one weekend. So far, these kicks were shaping up to be pretty awesome! Things I Loved – It’s been SUPER rainy in Colorado the last few weeks, and getting outside to run has been a challenge. That being said, the GOrun4s served me well on the treadmill and elliptical, and I think I would really love them for heavy walking activities like going to the zoo or walking the Vegas Strip. 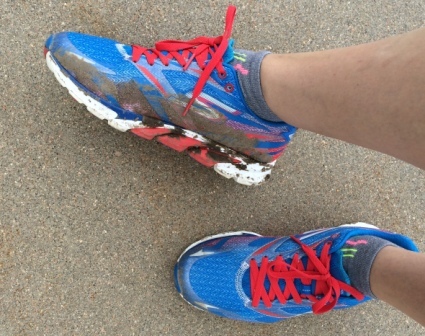 I was able to get them out on one run, in the mud, for the final in my Walking & Jogging class. Yes, I took a class, and yes there was a final. Don’t judge! I was super sad they got all dirty, though. BUT, they held up great, they felt good, and my feet stayed dry, surprisingly. New no longer but still comfy! Things I could have used more of: Over pronation of my left leg and being flat-footed results in the need for two things; a healthy drop and arch support. These shoes don’t have much of either, which is great if you like a minimal shoe. Which is, in fact, what this shoe is designed to be; minimal. If that is your thing, then I think you might like the GOrun4, and I think Cam should try a pair, too! Overall, I like the GOrun4s, but I’m still deciding if I like them for longer distances. With the crappy weather lately I’ve not been able to go more than 3 miles in them, and mile 4 is usually when the over-pronating makes my left hip and knee hurty. The jury (me) is still deliberating. I’m excited to keep wearing them and see how they work for me throughout the summer. It will be nice to have a lighter, cooler pair of kicks to put into rotation! I would recommend them to anyone who likes a minimal shoe, and don’t let the fact that they are Skechers make you pause. I found them to be quality shoes with quite a bit of science behind them. At least try a pair on, I think you’ll be as pleasantly surprised as I was! This post was sponsored by the BolderBOULDER and Skechers, who provided one free pair of Chevron Houston Marathon Edition GOrun4s for me to use, review, and keep. This entry was posted in Road Tested and tagged BB10K, BolderBOULDER, fitness, health, healthy living, product review, run, running, Skechers, training. Bookmark the permalink. Great review, Jenn. 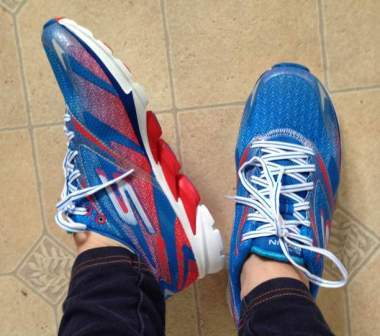 I, like you, pause when I heard that Skechers are making performance shoes but it makes sense! I need a bit more than a minimal shoe, I wonder if they also have shoes that are neutral. I’ll have to check out the site (even though I’m married to my Mizunos)! Thanks Mer! I took a look at the entire performance line on their website and it does look as though they have a variety of different types of shoe. I think they’re really working hard to establish a place in the running shoe market, and they seem to be doing a good job thus far. I am curious to try some of their other offerings, and I love the color combos they have! Adorable!